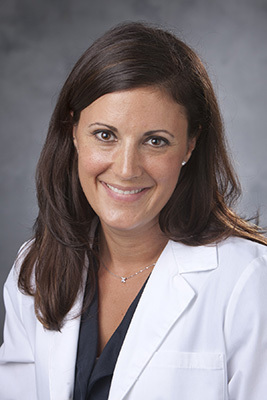 Breast cancer surgeon Rachel Greenup, MD, MPH, began running when she was just 11 years old. She was one of six children and there was little opportunity for alone time. Greenup has been running ever since. Over the years she has participated in several competitive runs, including the annual Tuna Run 200, an overnight relay in which individuals team up to run a combined 200 miles to the best catch of the day — a tantalizing tuna dinner with all the fixings. Teams of twelve runners alternate running all day and all night, starting in Raleigh, North Carolina, and ending 200 miles later at Atlantic Beach, North Carolina. Greenup’s 12-member team, consisting of faculty from Duke and UNC, is running to benefit the Pretty In Pink Foundation, a local non-profit providing financial assistance for life-saving treatments to breast cancer patients across North Carolina. Team members will each run approximately 16 to 20 miles divided into three legs. Vans will pick up runners at designated exchange zones along the 200-mile route. This year’s Tuna 200 takes place on Saturday, Oct. 19. Greenup, a member of its board of directors, hopes she and her team are able to raise $5,000 for the Pretty in Pink Foundation. For more information or to donate, visit Team Greenup.